It's competition time again. Every day this week, we'll feature a new 'touch up' courtesy of Skyscraper City forums. Members of the forums were asked to get creative with image software and present an alternative view of London. 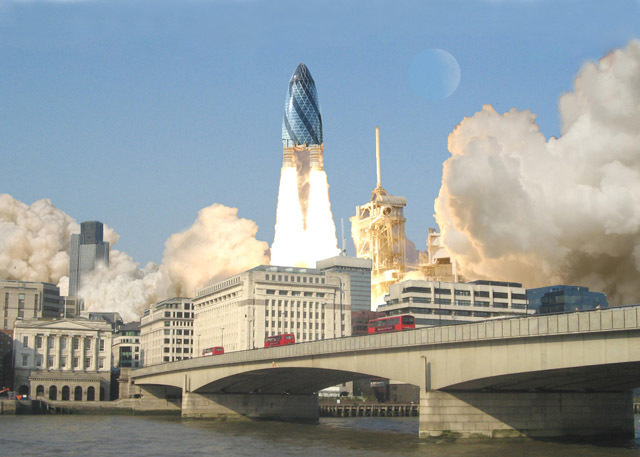 Today, 'wjfox2002' offers a boost to the City's flagging economy, as Foster's Gherkin lifts off for space. We'll be giving a prize to the best image. If you like what you see, please vote by clicking 'recommend'. More tomorrow.